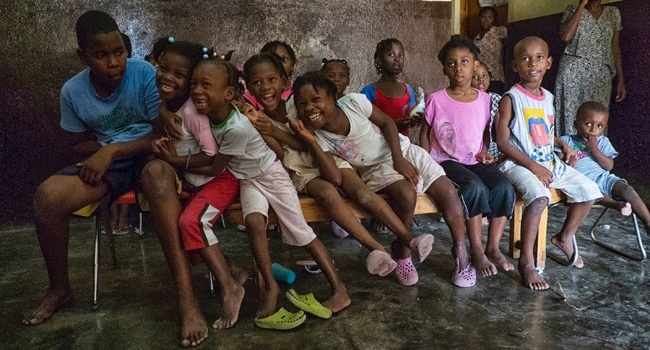 Image: Children at an orphanage in Les Cayes, Haiti, 2013. UN PHOTO/Logan Abassi. Used with permission. An investigation by the Guardian newspaper has revealed horrendous conditions for workers in the Thai fishing industry including 20-hour shifts, regular beatings, torture and execution-style killings. Four big global retailers -- Walmart, Tesco, Costco and Carrefour -- were all named as customers of a seafood supplier in Thailand with proven links to slavery through prawn feed. Tesco and Walmart have taken steps to eliminate slavery from their seafood. The powerpoint, Responding to Global Justice Issues: Mercy at the United Nations, prepared and used by Áine O'Connor rsm in her talk given on 29 September, 2014 as part of the MIA 20th Anniversary celebrations, is now available online in show format for download. God of love and mercy, touch with your healing power and restore to full health: Pat, Anne Nerbun, Mary Olejnik, Davida Morgan rsm, Maureen rsm, De Porres McCallan rsm and Ruth rsm and all whose names are on our prayer list. Editor: A message from Genemarie Beegan rsm, developer of these Mercy apps. Five Mercy apps are now on the Amazon app store and no longer available for download in Google. They continue to be available in Apple app store as well. This expands the options for kindle users, but might not work in earliest versions of readers. All are free for download and have no ads. On an iPad choose from “iPad only” to “iPhone only” on a tab at the top of the App store page. The apps will be listed there and work just as well on the iPad. It’s hard to miss the green giant as you step into the tidy third-floor apartment. The towering houseplant fills the space in front of the window and has reached the 8-foot ceiling and now doubles over on itself. Apparently all it needed to thrive was a happy, healthy place to call home. “It’s kind of a symbol. It just keeps growing. Kind of like me,” says Lynsey Christianson, whose eyes fill at the metaphor of this plant, grabbed at the last minute when she and her two children fled the chaos of her abusive marriage once and for all. She said her now ex-husband had killed all of her other plants out of spite and slashed the mattress where she had been sleeping. She had to find a different life. Within two weeks and for privacy reasons related to Catherine McAuley's living descendants through her sister Mary McAuley Macauley and her brother James W. McAuley, the two family histories listing Catherine McAuley's descendants through her sister and brother will be removed from the mercyworld.org website. There has been sufficient time for any sister, archivist, or researcher to access these family trees on the website. In the future anyone who wishes to access the genealogies may do so through the ancestry.com website. However, this will require that you seek access to the information located on ancestry.com by first contacting Mary Dennett rsm by email: mary.dennett@mercy.org.au Thank you for understanding. Anchored in Hope: Spiritual Growth and Development in the Ocean State was the theme of the 33rd Mercy Secondary Education Conference (MSEC) held October 10 - 11, 2014 at St. Mary Academy - Bay View Riverside (Providence), Rhode Island. This year's theme was based on the Mercy Educational Core Value of Spiritual Growth and Development. Keynote presenters were: Mary Rose Bumpus rsm, Ph.D (Mercy: The Abundant Compassion of God ), Deborah Troillett rsm, (Prayer in the Heart of Mercy), Richard Mary Burke rsm (Formation: Intentionally Passing on Mercy Culture) and Dr. Gloria Thornburg (Living Mercy). PowerPoint presentations in show format with accompanying texts are posted on the Network for Mercy education website for download and linked to this item. The 13th Biennial Australasian Mercy Secondary Schools Association (AMSSA) Staff Conference will be held in Adelaide, South Australia, 13-16 August 2015. Please Save the Dates. In June 2014, Mercy schools gathered in Philadelphia were given the challenge to make a DVD or PowerPoint on the story of Frances Warde. The students lived up to the challenge and the winning entries are listed below for all to see. 1st place: Merion Mercy Academy with their DVD 'Fierce Devotion – The story of Frances Warde'. Each winning entry received a wonderful plaque and had the great opportunity to be part of an on-going story of Mercy in our world. The site of the Network for Mercy Education is designed to share information, provide access to the sites of Mercy schools and education centers and encourage learning more about Mercy education. “Steeped in Mercy” is an online resource, a four part series, that could be used individually, locally in a formal group, or among Mercy educators. It was designed to provide approximately 2 hours of preparation in advance of a forty-five to one hour individual or shared session. Steeped was chosen as a word describing one’s desire to be filled, infused, and imbued with Mercy. TurboScan turns your smartphone into a multipage scanner for documents, receipts, notes, whiteboards, and other text. With TurboScan, you can quickly scan your documents and store or email them as multipage PDF or JPEG files.